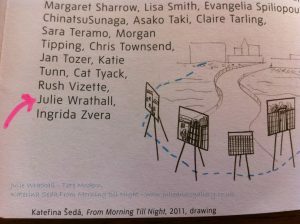 3rd September 2011 – I was one of eighty artists invited to join Czech artist Kate?ina Šedá to work on a project at the Tate Modern. A project two years in the planning by the Tate Modern Currators, came together on a sunny Saturday around the Tate Modern building. Eighty Czech Republic residents visited London to perform their daily tasks around the grounds of the Tate. Eighty artists sat on an imprint of their village around the river Thames and drew their village around them as they carried out their daily tasks. 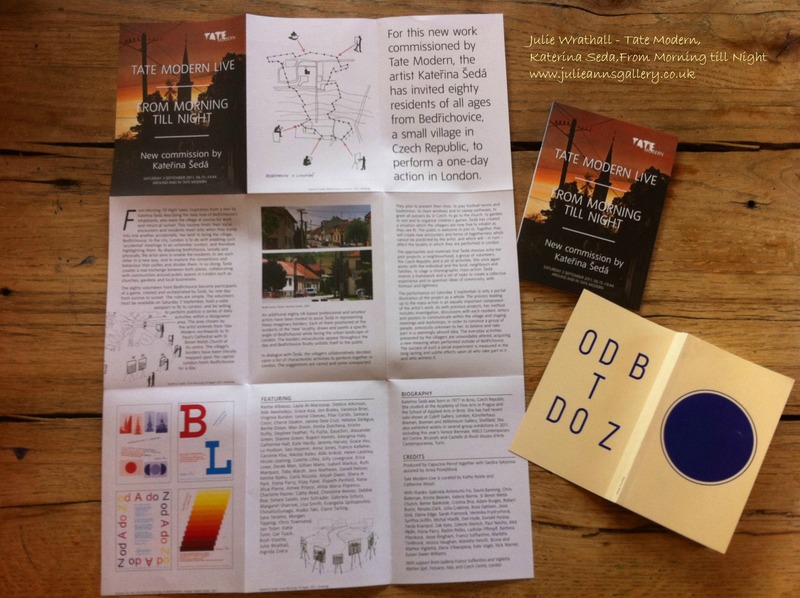 Met with some initial sceptisism, as the humourous booklet with transcripts of conversations of the Czech residents show, why would anyone take us to London? Katerina won the residents over and then moved onto the task of selecting the eighty amateur and professional artists. I found the request for artists through Twitter, and thought it was too good an opportuntiy to miss. I sent my pictures off and was delighted when I got an e-mail from Tate Modern saying they were “impressed with my work, and would like to invite me to join them”. It was to be filmed for their publicity and will hopefully be aired on Channel Four. Quizzed by many a passer by, understandably, wondering why we were not painting the view in front of us. 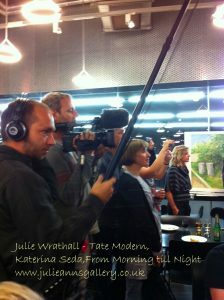 We returned our pictures to the Tate Currators. The pictures have been packaged up and accompanied Katerina back to Czech Republic, to be put in an exhibition in Bedrichovice (unfortunately, not at the Tate). A copy of any house drawn will be given to every resident who took part. All pictures will be published in a book, which I presume will be available for sale through the Tate Galleries. Each artist who took part will receive a copy and we will wait for updates when the film is available on line, or likely to be aired on TV. 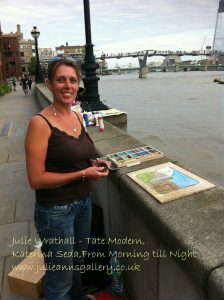 What an exciting day, to spend a sunny day in London painting, be in the staff rooms of Tate Modern, be at a drinks reception as one of the artists, I still get a buzz about it when I think about it now – fantastic experience and only made me hungry for more! 2015 Update – There is now a new London Style village square which has opened on 03/09/15, you can see pictures of the square coming together here, including red telephone box, and London style sign posts, London 16,440 min away, now aptly called Bedrichovice on Thames! See the official press release here. Could these two things help you? Wanna see my latest artwork…?